As I prepare to head to NightBEAT, there's little question what I'll wear: A Carolina Crown shirt. Specifically, my most recently purchased piece of Crown merchandise, which is purple, one of the corps' historic colors. I tend to approach my drum corps fandom much as I do my sports fandom, an environment in which, as Jerry Seinfeld famously quipped, we root for laundry. There are a couple of major disconnects with this as it relates to the DCI sphere, though. The first is the ever-changing nature of DCI uniforms. 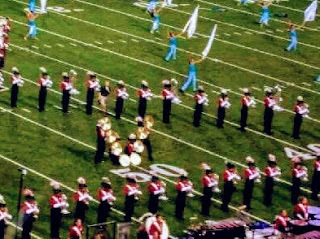 If I showed up in red and green in support of Santa Clara Vanguard, for example, it would be at odds with their current look. Same for Crown's purple or cream, and even the Bluecoats ditched their eponymous color and won a championship in spite of it. The other is that as much as DCI touts itself a Marching Music's Major League, it operates differently. As an association, DCI probably more closely mirrors the craft beer and RV industries. The first fight they face is the value proposition. Stone's opposition isn't Dogfish Head; both of them are competing with Budweiser, Miller, and Coors. Likewise, the goal of the RV industry is to get you to choose that mode of vacationing over hotels or other means; whether you choose a Jayco or Coleman comes secondary. In sports, some of the smaller leagues like Major League Lacrosse and the WNBA benefit from cultivating fans of the sport. In drum corps, the primary objective is getting new fans into shows and choosing the experience. Drum corps fans also behave markedly differently than sports fans. Booing, for example, is frowned upon. There's a mutual respect between not only the competitors, but the fans. And what's perhaps the most incongruent: As a subjectively objective, arts-based activity, there can be acknowledgment that you like another team better than your own. As a sports fan, that's virtually unheard of, at least in a head-to-head setting. But there have been years where I simply haven't liked "my" corps' show as much as a competitor's. There are those who would throw the whole competitive system away and just observe excellence. For my money, I love the competition, but as long as corps are putting great shows on the field, we're all winning.